Apicoectomy (Apico) is a procedure to salvage a failing root canal. The procedure is performed mainly by oral surgeons. Dr. Muduli recommends the use of I.V. general anesthesia since the procedure can take up to an hour to perform. The apico has a success rate of 70-80%. 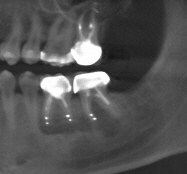 Below is an panorex radiograph of a patient who needed 2 apico's on her posterior molars.